Virginia's Liberty University has updated its stadium network infrastructure as part of an overall remodel undertaken as part of its decision to move its football team into a new NCAA division for the start of the 2019 season. According to the university, the network will now support 25,000 devices in the facility, along with high-definition video streaming and WiFi calling for Flames fans. Wireless, security and network management functionality were all upgraded. 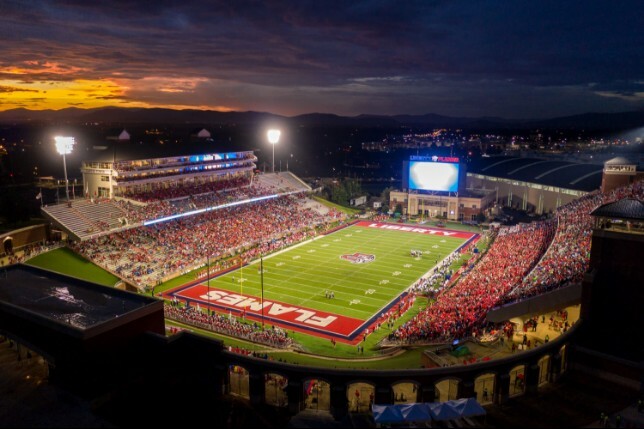 A recent test of the infrastructure took place during Liberty's first home football game of the season. The IT team measured 10,000 unique devices connecting to the network among 20,000 attendees. People experienced average speeds of 1.2 Gbps down and 770 Mbps up, with almost a terabyte of data traffic. The update occurred as the institution prepared to join NCAA Division I as an independent team. Stadium seating was expanded to accommodate up to 25,000 people. The university also added a new scoreboard and more concessions and restrooms, and made improvements for road and foot traffic. The university, which had already been using HP Aruba gear, chose access points from the same company, as well as Aruba ClearPass for network access control and guest access, and Aruba AirWave for network management. "The main goal of the university and our IT team is to keep our fans in their seats in a state-of-the-art stadium, run by a state-of-the-art network," said Richard Lee, the university's assistant director for network and media operations, in a statement. "With Aruba, we were able to satisfy these immediate requirements, upgrading the network in just under a year, while ensuring that the infrastructure can handle our future plans for expansion." The school was "pleased" with the network test run during the home opener and expects "to see additional uptake as we progress through the season and our fans realize the stadium can now deliver a great mobile experience," added Thomas Norton, a wireless network architect at the university. Liberty intends to expand its network infrastructure to deliver a comparable experience in other public venues, including its baseball and softball fields, indoor track facility and indoor pool building.